The black paint I had was gloss black and the clear coat I had was matte, so I hoped it would help lose some of the gloss. The lower grille is textured matte black, and the plastic bit that hangs lower than the painted surfaces is textured matte grey. you know paint is only $5 a can or so. you could always pick some up. you could also use that coating dip stuff you talked about on another thread. got it a home depot or lowes maybe? I think you said it had a texture and was thick so as to not chip when rocks hit it. If you have a plastic store around (need to look for it), then get a couple of small pieces of black ABS plastic, and heat bend it. No need to paint, might look more stock than what you did. For the top grill, if you want to mold something, have you considered the following? Wrap plastics with saran wrap. spray expanding foam like "right stuff". When dry, sand it down flush. Carefully pull all parts out and remove saran wrap leftovers, cover new part & finish (pastic dip, fiberglass or plain duct tape), then re-insert finished product. For clear coat, you need to do a "wet coat", thick enough to look wet, but no more, because then it starts dripping. And yeah, no humidity, and do the spray in the shade and not with excessive heat. Yeah, I already decided earlier today that I'd stop and get some paint on the way home. I really should always have some flat black at my house, and Plasti-Dip spray is just too cool not to have around. I know I've got a can of clear Plasti-Dip spray somewhere but I can't find it. sonyhome, that's a good idea about the upper grille. It comes off the car with a few screws and clips, very easy, so I can take it off, wrap it up, and fill the spaces with nearly anything I want. I know for a fact that expanding foam won't hold up; my dad used it to build out the missing pieces of housing on a broken van mirror once. I don't think even a thick coat of Plasti-Dip will protect it, it's just not structurally sound enough. Maybe I could use the pre-fab foam space filler I was talking about and fill the remaining gap with silicone or hot-melt glue. 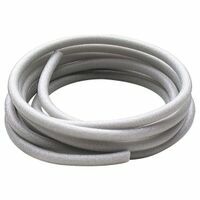 I can't find it on Home Depot's site, but imagine a garden hose made of closed-cell styrofoam, available in various diameters. There are foamproducts that are pretty solid out there. I've seen them at the Tap Plastics store. You could also go into arts stores and get the plastic clay people use to make shapes or other similar products. If you epoxy& fiberglass, you won't care how flimsy the foam is, BTW, but that'll be too much work and too professional. You could even carbon-fiber coat it for that ricey look. It's not made thick enough for my upper grille. I did stop and buy flat black spraypaint and flat black Plasti-Dip spray. Stupid question, but why not just cut a piece of black corrugated plastic and fit it behind the upper grille? Or does the car's design not lend itself to such a solution? I'm just not confident that I could do it in an inconspicuous way. Edit: Additionally, the last gap is between the grille and the hood and there's probably nothing I can do about that one. I see the dilemma now... fabricate something to block it off, not be too conspicuous, and have it be reversible with no damage for when you turn it in at the end of the lease... you sure have your work cut out for you. Make it easy first to se if it matters to be flush or not.